Today we had to descend 1000m until the Intipunku or 'the Port of the Sun' where the sanctuary can be seen. We ate our granola with 'mate de coca', packed and started a 1000m climb-down. The sunrise gave a picturesque view of golden rays penetrating the deep valleys. After crossing the ruin of Phuyupatamarca we dived into the cloud forest. The way downhill took forever. We met two teams making documentaries about Machu Picchu and the surrounding nature. In this forest lives the smallest humming bird in the World with a length of only 5 cm. 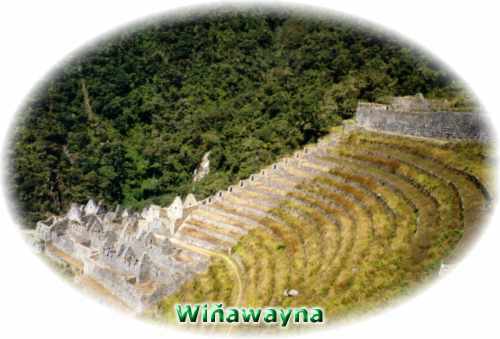 In 1992 they found terraces by coincidence uphill between Wi�awayna and Intipunku. The University of Cusco (UNSAAC) cleared the terraces and 5 small buildings were found. The ruin can be visited since 1998 but they is not very interesting. A shortcut to the sanctuary of Machu Picchu existed in Inca times crossing Intipata but the severely proliferated path because this part of the Trail hasn't been cleared in 500 years and forgotten. It is possible to visit Intipata and spend the night there. But you have to return to the cleared Inca Trail and continue via Wi�awayna to the Intipunku. Visit these terraces only when you have some spare time. When going to the sanctuary of Machu Picchu, mind that your in your ticket for the Inca Trail ($12-$15, depending on the starting point) is included. The time of arrival in the city isn't important, a whole day will be charged. Most travelers try to arrive early in the morning and slept the night before in the many hostels next to the ruin of Wi�awayna. The trail to Intipata is easy to find. Approaching the ruin of Wi�awayna you'll find a high voltage mast right next to the trail. 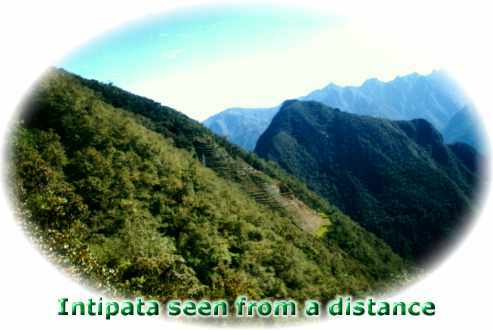 Almost all trekkers will continue the trail (right hand side), the ruins of Intipata are on the smaller road left, it is only a 20' to half an hour trek and almost horizontally. We passed Intipata and continued to Wi�awayna where Zenon was waiting for us. He and his fellows had already prepared dinner, a delicious salad. We explored shortly Wi�awayna and continued to the hostels on a 5' walk of the ruins. Time for a beer. Wi�awayna is usually translated as 'Forever Young' but it can also mean 'from growing young to growing old' referring to the crops. A friend a mine likes calling this spectacular ruin a herb hospital. 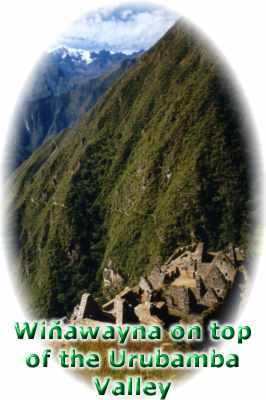 She is convinced that Wi�awayna was used as a last stop in the voyage of the human soul to learn eternity in the sanctuary of Machu Picchu. Lots of healing herbs were found there. This place could indeed been used as a kind of hospital to heal the last stains on the soul (living there a long time and studying the Incas gave me an intuitive idea of how they thought and lived and this may be possible).